"This is the story of the creation and consequences of the greatest and the longest engineered structure ever built, the Interstate Highway System. Imagine the state of Connecticut knee deep in earth; that's how much was moved for the Interstates, Or a wide sidewalk extending from the earth to a point in space five times beyond the distance to the moon; that's how much concrete was poured for the Interstates. Or a land mass the size of the state of Delaware; that's how much property highway authorities acquired in order to site the Interstates. Or enough drainage culverts to handle all the needs of a city six times the size of Chicago; that's how much was laid beneath the Interstates. The Great Wall of China and the Interstate Highway System are among the few human creations that can be seen by astronauts from an orbiting spacecraft. "But statistics are the least interesting chapter in the story. The high­ways became a stage on which we have played out a great drama of contradictions that accounts for so much of the history of this century. On this stage we see all our fantasies and fears, our social ideals and racial divisions, our middle-class aspirations and underclass realities. The system connects American cities and people in a vast web of roads that carry the life of the nation; yet to build it, tens of thousands of Americans were dispossessed of their land and saw their homes and neighborhoods destroyed. It gave Americans almost complete mobility and yet endless congestion. 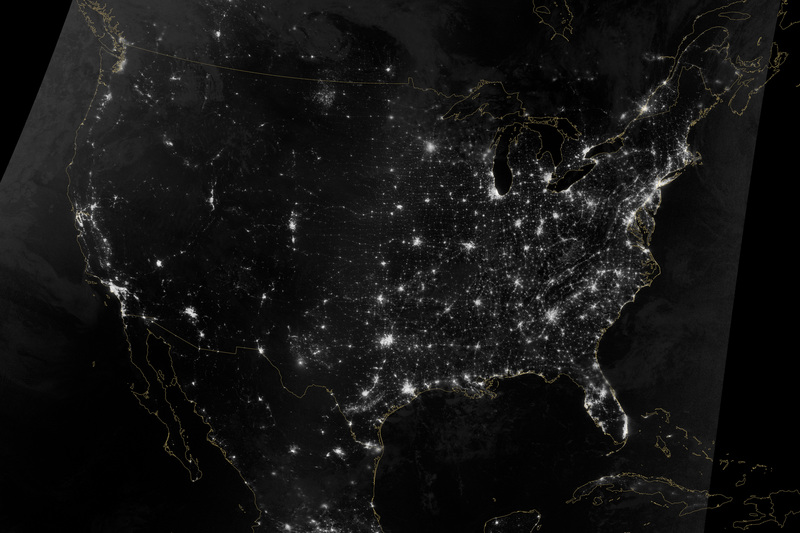 NASA Earth Observatory image of United States transportation web. Click to learn more. "While the Interstate Highway System was envisioned and designed by white men, its impact has been felt by everyone. Most people in the 1950s and early 1960s regarded the highways as a technological and social triumph. The roads afforded those who once had to live in a city and walk to work at a factory the chance to have a home in the rela­tive safety, privacy, quiet, and cleanliness of the suburban countryside. Beginning in the mid-sixties, however, many people began to blame the highways for a new spate of problems in American society. Often, city neighborhoods were chopped up and destroyed, downtown centers abandoned for the easy-access malls that sprang up at exit ramps. The Interstate made long-distance commuting possible, thereby contributing to the 'white flight' that separated races and classes from each other. More often than not, urban planners laid down the roadways in the neighborhoods of African-Americans, Hispanics, and other minorities, people who did not possess the political power to challenge them. In the ensuing years, planners and residents alike found that new highways had the power to divide rather than unite us, and that they could transform a once vibrant neighborhood into a cold, alien landscape. "The small towns not on the main thoroughfares have dwindled, some have disappeared completely. The highway engineers chose time and again to put the roadways hard upon the banks of the country's rivers, severing city dwellers from the waterways that had once been the most significant natural features in their landscape." I could not hep but fast forward to today where the new Interstate is the Internet. It has enabled people to "work different" and live where they want, and it is threatening the mall-based retail system. On the positive side, it has the potential to reduce carbon exhaust, although Chicago's rush hour is no more merciful yet.